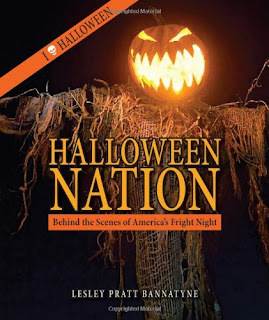 Title/Author: Halloween Nation by Lesley Pratt Bannatyne. Source: Given to me as a gift. Favorite quote: “At Halloween, fear is fun.” ~Lesley Bannatyne. All in all: Entertaining and informative. Easy to read. My Thoughts: Full disclosure: Lesley and I are friends. We weren’t always though. There was a time, when I just a fan, in awe of her writing talent and knowledge of Halloween. But over time, we have e-mailed, talked, danced together in costume and even shot authentic Kentucky bourbon in Louisville. Okay, I sipped it and couldn’t even finish it. Lesley, on the other hand, shot it back, slapped her cash on the bar and dashed out the door to a haunted attraction tour. She’s quite a lady! I usually approach non-fiction books with a bit of trepidation, dreading text book type passages, dry words and language or concepts that are over my head so I have to re-read them three times to grasp the content. But Halloween Nation is filled with plain ol’ Halloween fun. Halloween Nation is Lesley’s more than usual immersion into the world of Halloween. The New York City Greenwich Village Parade, zombie walks, naked pumpkin runs and Halloween and Vine are just a smattering of the places explored. Musicians and organizers and witches (Oh my!) enlighten us on their views and activities of the holiday. Lesley delves deep into a few mythological aspects of Halloween such as Jack-o-lanterns (don’t worry-still not dry) and how the internet has changed the holiday. What I loved best is that I felt I was right alongside her. Her voice is friendly and fun and her writing is clever and fresh. She’s self deprecating, inquisitive and charming. (I know, you’re probably thinking I only wrote that because she’s my friend. But if I felt any different I wouldn’t have said anything at all!) The book went by very fast. I would sit down only intending to read a page or two and before I knew it chapters sped by. Interspersed within the pages are quotes and gorgeous photos. The book is high quality, it even smelled good…just like a book should. Too weird? If you have any interest in Halloween at all, you will find some amazing events that you never knew existed, perspectives that you never thought of and people you would love to meet. Being a huge Halloween fan, I felt as if I was reading my own thoughts echoed in other people’s quotes. I found myself nodding in agreement and understanding. I smiled, I laughed out loud, I learned and mostly, I was absolutely delighted. Visit Lesley’s website I Skull Halloween. Read my interview with Lesley from last October (2010) HERE. So cool that you've danced and taken shots with the author. It must be fun to read a friend's work and really enjoy it. What an awesome book! I will definitely have to check it out. I love Halloween!! Hi, you are the winner of Pretty Little Dead things over at Telly Says! I emailed you to get your mailing info. Congrats!!! @Missie-I was pretty shocked too! No pics of that in the book though, lol. Maybe the web. @Karen-I hope you do. It is a great book. @Michelle-I hope you pick it up! @SenoraG-Thx! I'll look for the e-mail. Huh, I kind of want to shoot bourbon with you and Lesley!